In the mid-19th century, northward migration of Hispano Americans in the Colorado Territory met the westward expansion of Anglo Americans. After the United States annexed Mexico’s northern territories in 1848, the new American citizens of the Southwest moved north and east. One of these Hispano Americans was Teofilo Trujillo, who settled with his wife in the San Luis Valley west of the Sangre de Cristo Mountains in 1865. 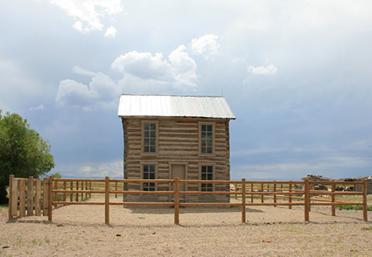 The Trujillo Homesteads is a National Historic Landmark that recognizes the importance of the family’s two Colorado ranches as illustrations of the settlement history and influences of Hispano culture in the United States. The Trujillo Homesteads reflect and contribute to our understanding of the experiences of Hispano American settlers on the American frontier. The Homesteads also tell the story of the differences between Hispano and Anglo approaches to ranching in the 19th century and the tensions these cultural differences caused. The Trujillo Homesteads today are part of the Zapata Ranch, which the Nature Conservancy owns. They are located within the Sangre de Cristo National Heritage Area, which is also featured in this itinerary. Hispano American settlers migrated to Colorado’s San Luis Valley in the 1850s and began to form agricultural communities there as the United States military suppressed the American Indian threat to these settlers. The Northern Ute Indians dominated the valley until the 1860s, and Navajo, Jicarilla Apache, and Plains Indian tribes also traveled and hunted in the region. 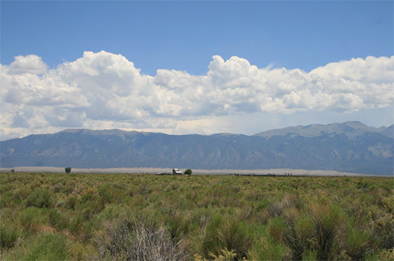 During the early decades of Hispano settlement, the American military presence in the San Luis Valley region discouraged conflict between settlers and Indian groups, which allowed Americans to move in and permanently settle the land. To protect the Americans’ claims to the land, the United States established a permanent outpost in the valley in 1856, first at Fort Massachusetts and then at Fort Garland. The majority of the valley’s early settlers from New Mexico lived and worked land communally, and they supplied Fort Garland with cattle, grains, and produce. These settlers lived in adobe homes built around common plazas, cultivated common land, and shared water resources. 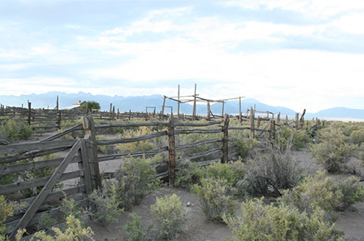 The Trujillos, who moved to San Luis Valley in 1865, broke from this settlement pattern by founding an independent ranch away from other settlements becoming among the first permanent settlers to claim land and ranch on what had been the domain of American Indians. Teofilo Trujillo was born in Rio Arriba County, New Mexico, in 1842, when New Mexico was still a Mexican territory. The Trujillos became American citizens in 1848, after the United States acquired New Mexico at the end of the Mexican-American War. Pedro Antonio Trujillo, Teofilo’s father, was a farmer and owned land worth $300 in 1850, which Teofilo likely helped cultivate. After his father passed away in 1863, Teofilo left New Mexico to settle in the Colorado Territory. He married Andrellito Lucero, whose parents were La Culebra settlers, while living in San Pablo in 1864, and the following year the couple established their ranch at Medano Springs in the San Luis Valley. The Trujillos had six children at their adobe house on the ranch, but only their firstborn son, Pedro Trujillo, lived to adulthood. Pedro established his own household at the second ranch in the Trujillo Homesteads when he married Sofia Martinez in 1885. The Trujillos astutely took advantage of U.S. land initiatives that encouraged settlement in the western territories. Though Teofilo never learned to speak English, he and his son built successful, independent American sheep and cattle ranches on public domain land. They acquired the land through the 1841 Preemption Law, the 1862 Homestead Act, and the Desert Land Law of 1877. By the time the Trujillos sold their homesteads, the ranches together had nearly 1,500 acres. The Trujillos developed a system of irrigation ditches to provide water to their fields and livestock. Everyone at the Trujillo Homesteads labored to support the ranches. Teofilo and Pedro raised cattle stock, milk cows, sheep, horses, and goats. In addition to produce for their own tables, they grew tobacco and wheat crops. While the Trujillo men worked in the fields and with traders, the Trujillo women prepared food, kept their houses clean and stable, spun wool and made clothes, watched young children, and cared for the sick or injured household members. The elder Trujillos constructed a substantial adobe house and other structures adhering to Hispano traditions but adapting American Indian and later Anglo ways as well. 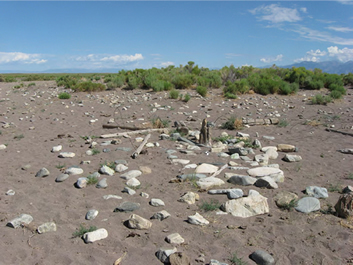 In the 1880s and ‘90s, Anglo and Hispano ranchers clashed over the use of public ranges in the San Luis Valley. The Hispano ranchers, like Teofilo Trujillo, generally raised sheep and the Anglo ranchers raised cattle. The cattle ranchers believed sheep grazing destroyed the grasses preferred by cows and, when the sheep population increased in the valley, tensions grew between the different livestock-producing groups. Teofilo owned one of the largest sheep herds in the valley and was the target of the cattle ranchers’ intimidation. His son tried to persuade him to give up sheep and return to raising cattle, as Teofilo did in his ranch’s early years. Pedro Trujillo was of the first generation of Latino Americans born in the United States after the Treaty of Guadalupe-Hidalgo, which transferred Mexican land to the United States. Pedro adopted Anglo culture in ways his Hispano father did not. Unlike his father, Pedro lived in a log house and he could speak, read, and write in English. More importantly, Teofilo kept sheep and Pedro kept cattle. In January 1902, four men raided Teofilo’s ranch and killed or dispersed a number of his sheep to intimidate him. During the trial of the alleged raiders, when the Trujillo family was away from the ranch, cattle supporters returned to Teofilo’s homestead and set the ranch buildings on fire. The adobe ranch house burned to the ground, taking the family’s possessions and $8,000 cash with it. The range war ultimately drove the Trujillos to sell their homesteads together for $30,000 in 1902 to the bordering Medano Ranch, which is now part of the Zapata Ranch. Teofilo and Andrellita moved to a new ranch in the San Luis Valley, where they continued to raise sheep. Though Pedro raised cattle, his connection to sheep herders threatened his ranch’s safety and he sold his land along with his parents’ ranch. Pedro and Sofia moved northwest, to the Sargents, Colorado area where they established a 400-acre ranch and Pedro served as deputy sheriff. Their descendents still live in the San Luis Valley. Today, 35.2 acres of the original Trujillo ranches (1865-1902) are part of the Trujillo Homesteads National Historic Landmark. There are no known 19th century sketches or photographs of the historic Homesteads, and only eye-witness accounts and archeological evidence help reveal what the Homesteads looked like during the Trujillo era. Two unattached areas make up the historic Homesteads property, which are the two ranch headquarters of the Trujillo family ranches. The Teofilo and Andrellita Trujillo Homestead area includes the site of the large adobe ranch house and other archeological remains. Prior to the 1902 fire, the adobe ranch house was impressive, and had stained-glass windows and oriental rugs, according to accounts. There are no extant buildings or structures at this site today but a number of archeological remains are still onsite. The second area is the Pedro and Sofia Trujillo Homestead, which contains the historic ranch house, horse stable, and corral. The ranch house, built in 1879, is a two-story log and adobe daub house with a single-story rear projection. The historic stable is an unaltered rectangular, log and daub structure. The Trujillos built the northern portion of the corral by 1885 and later owners added the southern portion sometime after 1937. The corral measures 206’ x 200’ and has six holding pens. The Trujillo Homesteads of the Zapata Ranch, owned by the Nature Conservancy since 1999, are partially located in the bounds of both the Great Sands Dunes National Park and Preserve and the Baca National Wildlife Refuge. Bison roam this rural, isolated region. The San Luis Valley Museum is located in Alamosa, Colorado, and visitors can also learn more about the region’s Hispano heritage at the San Luis Valley’s public parks and other cultural centers. The Zapata Ranch offers guests lodging and a chance to experience life on a contemporary bison ranch, and welcomes visitors interested in the historic Trujillo Homesteads. The Trujillo Homesteads is located inside the Nature Conservancy’s Zapata Ranch in Hooper, Colorado. Click here for the Pedro Trujillo Homestead’s National Historic Landmark file. For more information, visit the Zapata Ranch website or call 719-378-2356. Trujillo Homesteads is featured in the National Park Service Celebrate Hispanic Heritage Month online publication. New Mexican ranches of the 19th century are the subject of an online lesson plan, The Hispano Ranchos of Northern New Mexico: Continuity and Change. This lesson plan has been produced by the National Park Service’s Teaching with Historic Places program, which offers a series of online classroom-ready lesson plans on registered historic places. To learn more, visit the Teaching with Historic Places home page.